The Rock River Arms Carbine IRS rifles with integrated sights. When folded down the sights are flush with the top rail. This year at SHOT Show Rock River Arms introduced their Integrated Rifle Sight (IRS) rifles. The IRS rifles incorporate many of the outstanding features that have made Rock River Arms one of the most popular AR-platform manufacturers. On top of those great features, RRA has developed the IRS top rail. This additional feature appears to be an upgraded and longer RRA TRO hand guard from their Operator III series. Rock River Arms hit the ground running ever since their beginning in 1996. Bringing over a decade of experience from Springfield Armory and Les Baer Custom, the Larson brothers . That commitment to high standards won Rock River Arms a very prestigious contract from the U.S. DEA. That contract opened up the door to numerous other law enforcement contracts across the country, and from Federal to local agencies. My Department selected Rock River Arms AR-15’s for patrol rifles and the majority of our SWAT Team rifles. We have found the 2-stage triggers to be very crisp, with a positive and short reset. Accuracy has been around 1 MOA average between the rifles, but some have shown to be around 1/2 MOA. Our RRA rifles have been very durable, and we are planning on replacing the last of our older AR-15’s with Rock River Arms rifles in this next year. The new Rock River Arms Integrated Rifle Sights Carbine Length LAR-15. The aluminum hand guard is free-floated and octagonal in shape. Pre-milled oblong vent slots are aligned in every-other short and long slots. These milled slots and their placement help ensure the rifle is equally cooled during firing, and also reduces the overall weight to keep the rifle from becoming unduly front heavy. The IRS octagonal hand guard with two small Picatinny attachments. Here the front sight is folded flush to the rail. 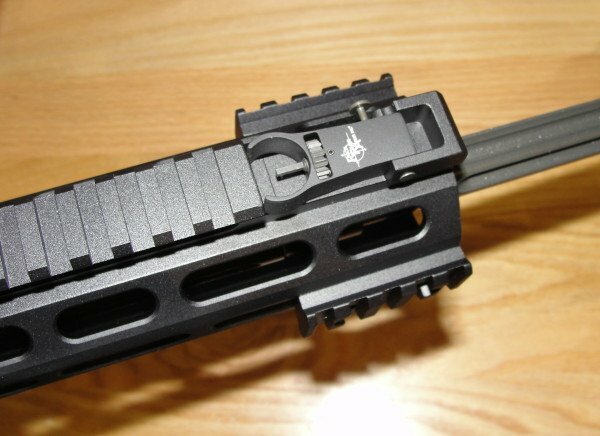 The IRS part of the hand guard has built-in back-up sights that when folded down are flush with the top rail instead of standing out like traditional add-on BUIS. 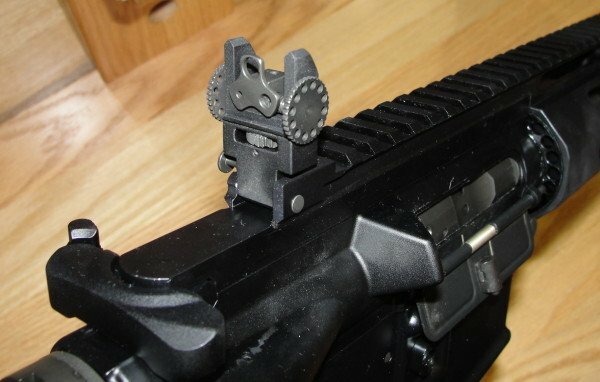 In addition, the IRS hand guard has a milled QD slot at the front of the hand guard for easy attachment of a sling mount, or (2) drilled screw holes for Picatinny rail attachments. The new Rock River Arms Integrated Rifle Sights LAR-15. This Carbine rifle has Picatinny attachments installed. The IRS front sight raises to the front, and locks into position when extended upward. There is a quick release lever on the left side for release. 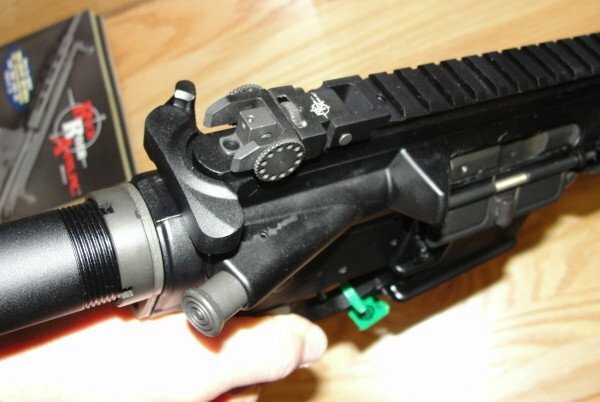 By simply pressing the release lever the IRS front sight can be lowered and secured in the downward position. The IRS front sight takes on a traditional front post with the semi-circle borders for reference. The front sight is adjustable for elevation using a horizontal adjustment gear located just under the top of the sight. This alleviates the need for a separate AR-15 front sight adjustment tool, or the old-school FMJ round. 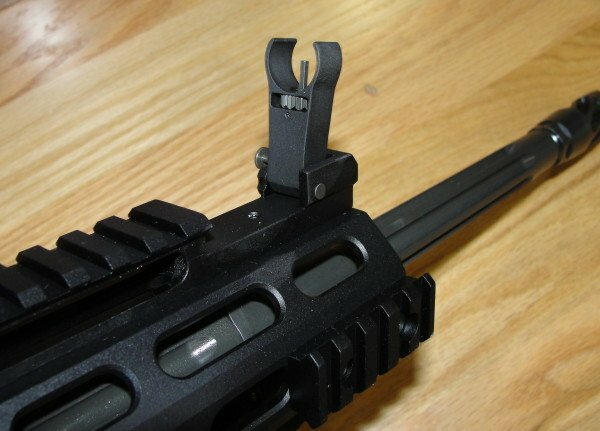 The IRS system has slots for the sights to fold down flush with the top rail. here the front sight is locked in the up position. The IRS rear sight has a wider goal post frame than standard A2 rear sights. The rear sight also raises forward, locking into the upright position when raised. There is a similar push lever to release the sight from its upward position and lower it back to its flush position on the rail. Here the RRA IRS rear sight is folded down flush to the rail. The rear sight has both elevation and windage adjustments. The windage adjustments are on both sides of the sight, in the form of dual turn wheel gears that allow the sight assembly to slide along the adjustment screw. The elevation adjustment is similar to the front sight, and located just below the rear sight assembly. A gear-like turn mechanism raises and lowers the sight assembly to the proper setting. The rear sight also has adjustable apertures. In addition to the traditional night (large), and day (small) apertures, the RRA IRS rear sight has a mid-sized aperture as well. The apertures are fixed in a 3-prong piece that is easily adjusted by rotating the aperture piece to either side to change the desired size. The rear sight folds down just before the charging handle. Notice the adjustable apertures. The Rock River Arms Helical muzzle brake tops off the fluted chrome moly barrel, and adds a very unique finish to the IRS rifle. Using the twists of the helical design to vent expelled gases in a top to bottom manner, places the pressure of the expelled gases in a constant downward force helping to “brake” muzzle rise. In addition the RRA helical muzzle brake has (6) ports at the muzzle end of the brake to further expel any remaining gases forward, providing an equal force to the rear to help stabilize the rifle and further reduce rise during firing. The helical muzzle brake is crowned with sharp points that can be used as a window break should that method of entry become necessary. 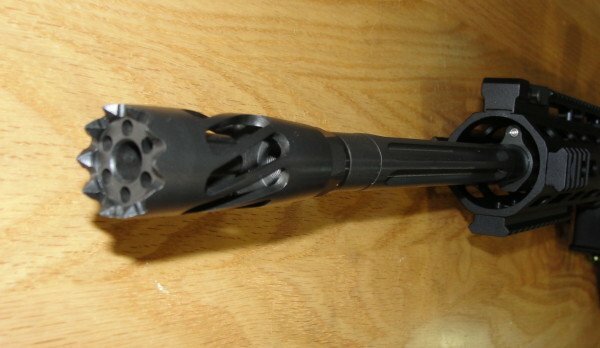 The RRA Helical muzzle brake is a very unique design. In addition to the open helical twists, there are (8) ports at the muzzle’s end to help vent gas forward further reducing muzzle rise. Rock River Arms offers four separate complete IRS rifles, with hand guards matching the appropriate length. The Carbine, Mid-Length and Standard (rifle) length rifles have a 16″ fluted barrel, while the Extended Length XL rifle has an 18″ fluted barrel. MSRP – $1,540.00 (Carbine); $1,565.00 (Mid-Length); $1,590.00 (Standard); $1620.00 (XL). The (4) different RRA IRS rifles in comparison. In addition to the complete IRS rifles, Rock River Arms is offering (4) complete upper receivers that an officer can add to an existing AR-15 lower receiver of their choice. The IRS uppers have the same features as the rifles, just without the lower receiver and stock. However, purchasing a complete rifle is more cost-effective. A sizing chart comparison from Rock River Arms is included below. The RRA comparison chart for IRS complete uppers. RRA needs to fire the guy who keeps convincing them to mount those ridiculous, hideous muzzle devices on all their high end rifles. Also, why does RRA sell AR’s in every caliber known to man except 300 blackout? Tyler, your demands have been met! They have six different models in .300 BLK. Some of these have been out for a couple of years, but just not advertised as well as the more popular 5.56 mm.